Golden “Go” Jennings wasn’t supposed to be on Bus 21 the day it blew up in New York City. Neither was her boyfriend, Chandler. But they were. And so was Rudy, a cute stranger Go shared a connection with the night before. And Caroline, a girl whose silence ended up costing nineteen people their lives. Though it’s been a year since the bombing, Go isn’t any closer to getting over what happened. With Chan completely closed off to even talking about it, Go makes an impulsive decision: round up the rest of the survivors and head to New York City. There they will board an art installation made of the charred remnants of Bus 21 and hopefully reach some sort of resolution. But things are never easy when it comes to rehashing the past. Uniting the four stirs up conflicting feelings of anger and forgiveness, and shows them that, although they all survived, they may still need saving. "Chandler and Golden versus the world" has been the motto of Chan and Go since they were 11. As seventeen-year-olds, they're a couple, and although they're still facing life's challenges together, there's been a distance between them ever since they became two of four survivors of a horrific bus bombing in New York City. It's been a year since that bomb killed nineteen teens, and Chan and Go are back home in the Hive, the Kentucky commune where they've grown up. Chan and Go are physically okay, but they both silently carry psychological wounds and secrets that are pulling their relationship apart. 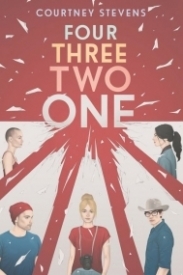 FOUR THREE TWO ONE by Courtney Stevens chronicles Go's efforts to reclaim herself in the aftermath of the tragedy. Go is a strong character, but she seems on the verge of breaking from the strain of not dealing with what happened on Bus 21. Go would like to talk about it with Chan, with her parents, or with the other survivors, but most of those closest to her refuse. This makes Go determined to revisit the scene of the bus bombing by returning to New York for the one-year anniversary of the event. An artist (who also happens to be the EMT who took care of Go at the scene) has taken the destroyed bus and turned it into a piece of art, and he's chronicled the whole process in a reality show. That show has also led to a college fund being developed for the four survivors, and that fund has allowed Go to dream of eventually escaping the Hive and leaving Kentucky for college. Go gathers others to travel with her to New York: a reluctant Chan, the other two survivors--both of whom have stories and secrets of their own--and Becky, a friend from school who seems to be just along for the ride but is an integral part of the group. There is so much going on in FOUR THREE TWO ONE that it's hard to give a synopsis without writing a full book report... in short, Stevens does a great job writing about broken teens who are trying to pull themselves together while managing the difficulties, both large and small, that life brings. The road trip aspect of the book keeps things moving, and some of the minor characters like Go's grandmother help keep everything grounded and "real." There are times when there is a LOT of talking, but these characters have loads of ground to cover, so that can be forgiven. This is a book that I would love to see made into a movie. The scenes throughout are vibrant, the main characters (and a few minor ones) are people I'd like to hang out with in the flesh, and I like the world that Stevens has built. Yes, really bad things happen, but there is plenty of good, ample amounts of hope, and room for dreams. Readers can learn a lot from Go's determination to "keep living a full life with a damaged past rather than a damaged life." My thanks to the publisher and YA Books Central for a copy of FOUR THREE TWO ONE in exchange for my honest review, and kudos to Courtney Stevens for another excellent book.